This fabulous citrus snack bar features a light cookie cake with a lemony whipped mousse top. So zesty and delicious, you'll never guess they're diet. Preheat conventional oven to 350°F or convection oven to 275°F (low fan). Add Lemon Cake Mix, Lemon Cookie Mix, and 4.25 ounces (1/2 package) of Lemon Mousse Mix to a stand/counter-top mixer. Using paddle, turn mixer on lowest speed to combine dry ingredients. While mixer is on, gradually add water and mix on low for 30 seconds, then scrape down sides of the bowl. Continue mixing on medium for 2-3 minutes. Spread batter into a prepared hotel pan (12"x20"). Bake in a conventional oven for 30-35 minutes or convection oven for 25-30 minutes (or until done). Cool and Chill. Empty remaining Lemon Mousse Mix into a mixer bowl. Add cold low-fat milk. Using whip attachment, mix on low speed for 1 minute. Then, mix on highest speed for 6-7 minutes. 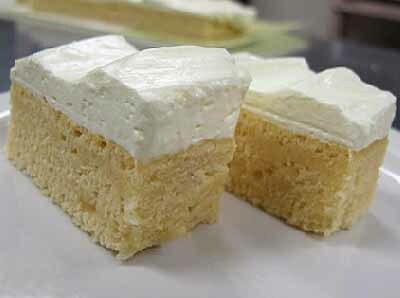 Spread Lemon Mousse evenly over chilled cake. Serve immediately.